My hair stylist really liked my set of n00b chains that I showed her at my last appointment. 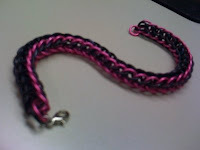 She wished she could have a pink and black foxtail bracelet. So I made her one to give her at my next appointment. It was very fun to make and only took the length of a movie to complete. This is again using anodized aluminum jump rings purchased from The Ring Lords. I wish I knew where to get black (or pink) lobster claw clasps, but I completed the project with a silver clasp which looks "okay". Next week I begin a class at Creative Side Jewelry Academy of Austin called "Fascinating Findings" taught by an amazing artist, Janise Simmons, in which I'll learn how to make my own custom clasps out of wire, so I'll just have to buy matching wire with my jump ring order for future projects. I can't wait! !